Draft: 2001, Texas Rangers, 5th rd. Christopher John Wilson... On Twitter: @str8edgeracer. Married Brazilian supermodel Lisalla Montenegro on Dec. 15, 2013. Personal website is LeftyLefty.com which updates his several off-field and charitable endeavors. Attended Loyola Marymount University following two seasons at Santa Ana Junior College where he was team MVP, the MVP of the Orange Empire Conference and California Junior College Co-Player of the Year in 2000... Graduated from Fountain Valley (CA) High School in 1998. Founded C.J. Wilson's Children's Charities in 2007 to raise funds and create awareness for charitable programs that benefit children and their families affected by chronic life-threatening illnesses or financial and social challenges... Hosts annual "Throw Strikes" bowling tournament each season benefiting the C.J. Wilson Children's Charities, Hematology and Oncology Clinic of Children's Hospital of Orange County and The Hemostasis and Thrombosis Center at Children's Hospital Los Angeles. In 2014, became charter member of Taylor Hooton Foundation's "Advisory Board" of active Major League players. The Hooton Foundation is widely acknowledged as the leader in advocacy against use of performance and appearance-enhancing drugs by the youth of America. In Jan. 2011 hosted a pair of baseball clinics in Cape Town, South Africa for players at both the grassroots and elite levels. Hobbies include learning foreign languages (speaks Spanish and Portuguese), travel, photography, DJing and collecting cars. Started the C.J. Wilson Racing team which competes within the Mazda MX-5 and Grand AM Cup series... Has aspirations of a professional racecar career when he is finished with baseball...Drove the pace car to start the 2010 Texas 500 NASCAR event at Texas Motor Speedway in Nov. of 2010… Also raced Formula Atlantic Cars at Mosport International Raceway in Canada and has won 25 Hours of Thunderhill twice. Owner of C.J. Wilson Mazda, BMW Motorcycles of Countryside as well as KTM of Countryside - a family of dealerships located just outside Chicago and Los Angeles. Appeared in an episode of the Fox comedy series "The Mindy Project" during the 2013 offseason. Was featured as the "Mane Man" in Head & Shoulders "Season of the Whiff" campaigns in 2013 and 2014, where he appeared in multiple commercials alongside teammate Josh Hamilton. Originally signed by Rangers scout Tim Fortugno. Finished the year with a 8-8 record and 3.89 ERA (132 IP - 57 ER) in 21 starts for Angels. Missed final 63 games of the season on the disabled list with left elbow inflammation. On June 13 vs. Oakland, became third Major League pitcher since 2000 with 90+ wins, 50+ saves and 1200+ strikeouts, joining Ryan Dempster and Derek Lowe. With fifth inning strikeout of Ryan Hanigan July 17 vs. Boston, became 16th A.L. pitcher since 2005, to reach 1,000 strikeout mark as a starter. Earned win in season debut April 7 at Seattle after tossing eight shutout innings… Retired each of last 17 batters faced… Threw a first pitch strike to 19 of 27 batters faced… Marked 20th career start of at least eight innings pitched and first with under 100 pitches thrown (96). Allowed three-or-fewer runs in seven of last nine starts. Had career-high streak of five consecutive starts allowing two-or-fewer runs from April 18 through May 12... Pitched to a 2.10 ERA (34 1/3 IP - 8 ER) in that span. Posted a 13-10 record and 4.51 ERA (175.2 IP - 88 ER) in 31 starts for Angels in 2014...Recorded 1,000th career strikeout in first start (April 1) vs. Seattle (Kyle Seager, 2nd inning)...Won six-straight decisions at Angel Stadium from April 13 - June 24, marking longest streak by Angels lefty since Chuck Finley won 10 straight from May 16, 1997 - April 17, 1998...Tossed complete game shutout May 17 vs. Rays...Held Tampa Bay to five hits and two walks while striking out seven...Marked second shutout of career and first as a member of the Angels...Seventh complete game of big league career...Had streak of 16 straight starts tossing at least 100 pitches snapped on June 3rd at Houston...Was longest active streak in Majors...Tied own club record for longest streak by a lefty (also, Chuck Finley - 1999)...Appeared as a pinch hitter in 13th inning on June 14th at Atlanta, drew a walk and scored later in the inning...Became first Angels pitcher to have a pinch hit appearance since Dan Haren May 20, 2012 at San Diego and first Angels pitcher to reach base as a pinch hitter since Mel Queen Oct. 1, 1970...Missed 18 games on disabled list with a right ankle sprain...Suffered injury July 9 vs. Toronto and exited game in 4th inning...Made one rehab start with Double-A Arkansas Aug. 28 vs. Northwest Arkansas...Earned win for Travelers after tossing 5.1 innings and allowing two earned runs on four hits with two walks and seven strikeouts...Tossed at least 105 pitches in 14 of first 15 starts but eclipsed the 105 pitch mark in just five of last 16 starts...Angels won each of his last nine home starts against American League opponents and went 12-3 for the year in his starts at Angel Stadium. Set a career high with 17 wins during second season with Angels and finished the year with a 17-7 record and 3.39 ERA (212.1 IP - 80 ER) in 33 starts, allowing 200 hits (15 HR) while walking 85 batters and striking out 188…Led all Angels pitchers in victories, innings pitched and strikeouts... Ranked T3rd in the American League in wins, 4th in winning percentage (.708), T4th in starts, 9th in innings pitched and 11th in strikeouts... Led the Majors with an average of 110.6 pitches per start... Became the 9th different Angels lefty all-time to win 15 games in a season and the first since Joe Saunders in 2008 & 2009... Eclipsed 200 innings pitched for the fourth straight season...Wilson and CC Sabathia are the only AL lefties to do so each of last four years... In 18 starts from June 14 to September 16, compiled a 13-1 record and 2.91 ERA (117.1 IP - 38 ER)…Led the Majors with 13 victories over that span…2.91 ERA was seventh in the AL over that span... Went 9-0 in 13 starts from July 10 to Sept. 16…13 straight starts without a loss is a new career high…The nine-game win streak (in decisions) was the longest streak by an American League left-hander in 2013 and the longest streak by an Angels lefty starter since Jarrod Washburn in 2002... Finished the year with a 12-start unbeaten road streak…Marks the longest such streak of his career and broke Chuck Finley's franchise record of 11 straight unbeaten road starts by a left-hander…The streak is tied with John Lackey for the secondlongest overall in Angels history and trails only Bruce Kison's 15-start unbeaten road streak from 1980-82... 24 of 32 starts were quality starts in 2013, including 13 of last 17. Tossed 11 straight quality starts at home from April 14-August 20, which marked longest streak in AL in 2013... Married Brazilian supermodel Lisalla Montenegro during 2013 offseason on December 14. Finished first season with Angels going 13-10 with a 3.84 ERA (202.1 IP - 86 ER) in 34 starts, allowing 181 hits (19 HR) while walking 91 batters and striking out 173...Led AL in games started (tied) for second consecutive season...Selected to second consecutive All-Star Game (DNP)...Eclipsed 200 innings for third straight season...On May 22 at Oakland, teamed with Ernesto Frieri for the eighth combined one-hitter in Angels history...Recorded 50th career win June 8 at Colorado, becoming just one of six active pitchers with 50+ wins and 50+ saves...Made back-to-back starts, May 11-12 at Texas, becoming first Major League pitcher to make starts in consecutive games since Aaron Myette (TEX), Sept. 3-4, 2002...Angels were rain-delayed on May 11...Finished first-half at 9-5 with a 2.43 ERA, matching most first-half wins in his career (also 2011)...Suffered 11-start winless streak, July 1-Aug, 23, marking longest such streak of his career. Finished season 16-7 with three complete games, one shutout and a 2.94ERA (223.1 IP - 73 ER) in 34 starts for Texas...Allowed 191 hits (16 HR)while walking 74 batters and striking out 206...Led the Rangers' staffwhile setting career-bests in wins, ERA, starts, innings and strikeoutswhile placing second in complete games and winning percentage...His206 strikeouts were most by a Rangers pitcher since 1990 and his 2.94ERA the lowest mark by a Texas qualifier since 1991...Finished rankedamong league leaders in starts (T1st), road ERA (1st, 2.31), wins (T4th),winning percentage (5th), strikeouts (6th), ERA (7th) and opponents batting average (10th, .232)...Recorded 10+strikeouts in six outings including a career-best 12 strikeouts, May 4 at Seattle...Six outings with 10-or-more strikeoutsmarked most by a Rangers pitcher since Nolan Ryan had six in 1991...Posted a 6-0 record with a 3.06 ERA (70.2 IP - 24ER) in 10 starts from May 25-July 16...Six-game win streak was one shy of his career-high and second longest by aRanger in 2011...Earned first career All-Star selection...Pitched the fourth inning of the Midsummer Classic, taking theloss in the 5-1 defeat (1 IP, 3 H, 3 ER, 1 HR, 1 SO)...Earned Rangers Player of the Month honors for June, going 3-0 witha 2.72 ERA (36.1 IP - 11 ER) in five starts...Registered the lowest-hit complete game of his career, July 21 at Angels,allowing two hits in an eight-inning CG loss...Tossed first career shutout, Sept. 6 at Tampa Bay...Took home A.L. Playerof the Week honors for the week of Sept. 5-11, winning both starts with 17 scoreless innings pitched...Rangers were21-13 in his 34 starts and have posted a 45-22 record in his 67 starts over the past two seasons...Posted an 8-5 recordwith a 2.31 ERA in 18 road starts, allowing three runs-or-less in 15 of 18 outings...Tossed six innings-or-more in 28 of34 starts and seven innings-or-more in 18 starts...Was the first southpaw in Rangers history to record two-consecutive200+ IP seasons...Became just the third Rangers pitcher in club history with 16+ wins, 200+ IP, 200+ strikeouts and aWHIP of 1.200 or less, joining Fergie Jenkins in 1974 and Nolan Ryan in 1989. In his 1st full season as a starter, led the club in ERA(3.35), starts (33), wins (15), complete games (3), and innings(204.0), and was 2nd in strikeouts (170) ... finished among A.L.leaders in opponents average (2nd, .217), starts (T4th), ERA(10th), wins (T10th), and winning percentage (12th, .652) ... hisstrikeout total was 8th-highest by any A.L. left-hander ... held opposingleft-handers to a .176 slugging pct. lowest in the majorsand a club record (Mike Venafro, .219 in 1999), while .144 (22-153) batting average vs. LHB was 3rd-lowest in A.L. and 4th inmajors ... .224 on-base pct. vs. lefties was also 3rd-lowest in bothA.L. and majors ... allowed just 5 extra-base hits (all doubles) and12 walks to LH batters in 169 plate appearances ... led the A.L. inwalks (93) and tied for 6th in hit batters (10). A member of the Opening Day roster for a third consecutive season, Wilson spent much of the year as one of the club's primaryset-up relievers, but also wound up recording nearly one-third of the club's saves...went 5-6 with a 2.81 ERA (23 ER/73.2 IP),converting 14-of-18 (77.8%) save attempts...left-hander led the club with a career-high 74 appearances, T4th-most in the A.L. andT6th-highest total in any single season by a Texas reliever...finished 30 games and had 19 holds, both 2nd-most on Texas staff...ledthe Rangers relief corps in appearances, innings, wins, strikeouts, walks,ERA, and ground ball/fly ball ratio (2.39)...first batters hit .377 (23-61) with9 walks to the tune of a .479 on-base mark...opponents batted .234 (66-282) overall, .206 (20-97) by lefties with no home runs...permitted just 3home runs all year, as his 0.37 HR/9 innings was 6th-lowest ratio amongA.L. relievers...permitted multiple runs in a single outing just 6times...worked a season-high 2.0 innings 5 times, no earned runs allowedin any of those outings. Left-hander began season as club's closer for the first time and saved a team-high 24 games...went 2-2, 6.02 (31 ER/46.1 IP)with 24 saves in 50 appearances out of the bullpen......despite missing the final 2 months, still led the team in saves and games finished(41)...also ranked among the team leaders in appearances (4th, 50) and relief innings (5th, 46.1)...gave up 8 HR, tied for mostamong Texas relievers...opponents batted .268, .265 (13-49) by lefties and .269 (36-134) by right-handers...retired 30-of-50 first battersfaced...first batters hit .348 (16-46) with 3 home runs and 6 RBI. Went 2-1 with 12 saves and a 3.03 ERA (23 ER/68.1 IP) in 66 relief appearances...opponents hit career-low .208(50-240), lowest by a Rangers reliever and 15th-lowest among A.L. relievers (minimum 150 batters faced)...converted 12-of-14 savechances and had 15 holds...first batters hit just .170 (9-53) with 9walks and 20 K's...converted 11 consecutive save opportunities,July 31-Sept. 4. Had his only save on Sept. 29 at Seattle...had a 3.29 ERA in 24 2/3 innings and 27 appearances after being recalled from Triple-A Oklahoma on July 18...struck out at least one batter in 17 of his last 27 outings...was optioned to Triple-A Oklahoma on June 1 and was 1-0 with a 2.45 ERA with two saves...in 11 innings, he struck out 17 and walked five in nine appearances...was 1-2 with a 5.16 ERA with the Rangers before the All-Star break...started the season on the disabled list with a strained right hamstring muscle...left-handed hitters batted .155 off him, while right-handers hit .292...opponents hit .256 off him with runners in scoring position, but just .218 with two outs. Made major league debut for Texas in 2005...was 1-2 with a 2.73ERA in 18 relief appearances...Went 1-7, 6.94 (37 ER/48.0 IP) in 24 games/6 starts in 4stints with Texas...contract was purchased from Frisco (AA) onJune 10 and made major league debut that day at Florida...alloweda single to only batter faced, Jeff Conine, but was credited with 0.1scoreless frame when Richard Hidalgo threw out JuanEncarnacion at the plate to end the 8th inning...made first ML starton June 19 vs. Washington, allowing 3 runs in 3.2 innings...was 0-2, 8.78 (13 ER/13.1 IP) in 6 games/3 starts before being optionedto Frisco on July 7...recalled on July 19, but did not appear in agame before being optioned back to Frisco on July 21...recalledagain for start on July 31 at Toronto...went 1-4, 6.93 (19 ER/24.2IP) in 7 games/3 starts before being optioned to Frisco betweengames of a doubleheader on August 30 vs. Chicago (AL)...earnedfirst ML win in the first game of the doubleheader, allowing one runin 5.0 relief innings...before the win, Wilson had dropped his last 15professional decisions dating back to his last victory on July 9,2003 vs. Arkansas with Frisco...recalled on September 5, going 0-1, 4.50 (5 ER/10.0 IP) over his final 11 relief appearances to finishthe season with a 6.94 ERA...earned first ML save on August 26vs. Minnesota, tossing 4.0 scoreless innings to close out a shutoutwin...was 0-5, 12.05 (29 ER/21.2 IP) in 6 starts and 1-2, 2.73 (8ER/26.1 IP) in 18 relief appearances...opponents hit .321 (63-196),the 8th-highest average allowed by any ML pitcher with 48.0 or more innings pitched...Went a combined 0-5, 5.10 (27 ER/58.1 IP) in 13 games/starts with Bakersfield (A) and Frisco (AA)...had 57 strikeouts in58.1 innings pitched...began the season with Bakersfield and was promoted to Frisco in early May...Went 0-1, 3.29 (5 ER/13.2 IP) in 4 games/starts for the Blaze...held opponents to a .189 (10-53) average...had 14strikeouts against just 4 walks...issued just one walk in first 3 starts and 10.2 innings...tossed 3.0 shutout frames on April 16 vs.Visalia...had a 2.70 ERA (3 ER/10.0 IP) over final 3 starts to drop from 4.91 to 3.29...Promoted to Frisco in early May...had pitched entire 2003 season with the RoughRiders...went 0-4, 4.43 (22 ER/42.2 IP) in12 games/starts over 4 stints with Frisco with 43 strikeouts against 14 walks...posted 1.40 ERA (4 ER/25.2 IP) over final 7 outings atDouble-A to drop from 8.53 to 4.43...first start came on May 2 vs. Wichita, allowing 2 runs in 4.0 innings...made 9 of his 12 starts atDr Pepper/Seven Up Ballpark in Frisco...recorded season-high 8 strikeouts on May 18 vs. Midland...also matched season high with5.0 innings pitched in that start (also July 7 vs. Corpus Christi)...opponents hit .290 (51-176). Did not play while recovering from Tommy John ligament replacement surgery. Spent the entire season at Frisco, going6-9, 5.05 (69 ER/123.0 IP) in 22 games/21 starts...finished 2nd on the team in starts and innings and 3rd in strikeouts (89)...tossedseason-high 8.0 innings, allowing 4 hits and no runs in win over Midland on May 5...threw 6.1 shutout innings in win over Tulsa onJuly 4...recorded season-high 10 K's in 7.0 innings in losing effort on June 5 at San Antonio. Opened the season with 8 consecutivewins from April 6-May 23, posting a 0.87 ERA (5 ER/52.0 IP) in that 12-game span...named to the Florida State League All-Star Team...earned a late season call-up to Tulsa on August 3...was 1-0 with a 1.80 ERA (6 ER/30 IP) in 5 games/starts for theDrillers...lone Tulsa victory came on August 8 at Arkansas as he tossed 6.2 scoreless innings. Split time with Pulaski andSavannah...began year with Pulaski, earning first professional win with 6.0 shutout innings on July 28 at Danville...held Appy Leagueopponents to a .178 average...recorded 6 or more strikeouts in 6 of 8 games with Pulaski...joined Savannah on August 8, pitching 2complete games...lone win came on August 25 (G2) vs. Columbia...rated 30th-best prospect in Southern California by BaseballAmerica prior to 2001 draft. November 3, 2016 LHP C.J. Wilson elected free agency. November 3, 2016 Los Angeles Angels activated LHP C.J. Wilson from the 60-day disabled list. May 25, 2016 Los Angeles Angels sent LHP C.J. Wilson on a rehab assignment to Inland Empire 66ers. November 6, 2015 Los Angeles Angels activated LHP C.J. Wilson from the 60-day disabled list. 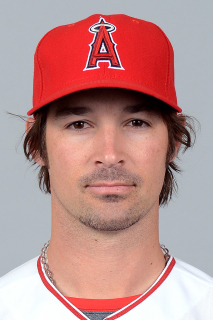 August 2, 2014 Los Angeles Angels activated LHP C.J. Wilson from the 15-day disabled list. July 28, 2014 Los Angeles Angels sent LHP C.J. Wilson on a rehab assignment to Arkansas Travelers. December 10, 2011 Los Angeles Angels signed free agent LHP C.J. Wilson. October 30, 2011 LHP C.J. Wilson elected free agency.